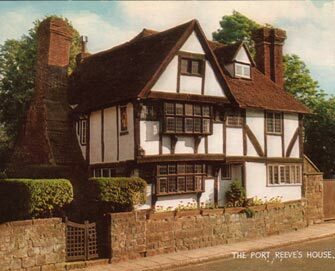 The Port Reeve’s House in East Street is believed to be the oldest house in Tonbridge, and is a most attractive and intriguing building. It is one of only four buildings listed Grade 2* – the others being the Parish Church, The Chequers and 124 High Street next door to it, with the Castle the only Grade 1 building in the town. In 1259 Henry III allowed consolidation of the wall and fosse around Tonbridge, with three gates: North by the (present) Ivy House, South at the Big Bridge, and by a narrow footbridge from the East. The fosse can still be seen up to 10 feet high in the garden of the Port Reeve's House, so it seems likely that the port reeve was the town official who here levied tolls on stock and commodities passing the ‘port’ or entrance to the town along Swan Lane (as East Street was known as late as 1860). The cellar of the house appears to date from the 12/13th century, when it was a defensive blockhouse, and the original dwelling on the site (behind the current frontage which is some 100 years later) was about 16 feet square, built probably c.1350-1400: there are still original roof timbers in the loft and the original cow-dung roof in the void. Several extensions have been added, at about 100 year intervals, of which many features remain, including a bake oven with shared crooked chimney in the sitting room, and traces of the original unglazed mullioned windows in the hall. For a time the house was a hostelry (called the Old Swan Inn and later the Ivy House – when the current Ivy House was called the Elephant and Castle). Later it was two cottages, one of which was a sweet shop. According to Census records, one of the cottages was the home, between the 1840s and 70s, of Edward Sales, a brewer, and his wife and sons, one of whom, George, became a painter of magic lantern slides. The building fell into disrepair, but was reconverted and carefully restored as a single dwelling in 1932. 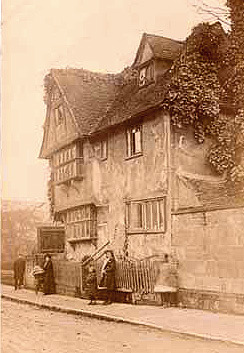 According to the Official Guide to Tonbridge, c1950, the house was ‘blown sideways by the explosion of a flying-bomb nearby’, but was skilfully restored by the Society for the Preservation of Ancient Buildings. The Port Reeve’s House remains in private hands.